In another part, Dororo and the lone wanderer, Hyakkimaru, are walking together, Doror has some business offering to the Ronin, to go and kill the monsters that live in the land and let the villagers pay them to do it! Dororo wins, Hyakkimaru wins, the villagers win, everybody wins! Hyakkimaru just keep walking, he can´t hear, talk or see, but he can feel the aura of the living things, and he knows that a little one is following him, since his flame is pure, he can stay. The Ronin detects some berries and both of them start eating, then he goes to the river and catches some fishes; Dororo stops him from eating them raw and start cooking them, they need salt, but this is better than raw. Then Dororo ask for the name of the wanderer, the little one puts the hands of his partner on Dororo´s face and says his name “Do-Ro-Ro” then puts the tiny hands of a kid in the Ronin faces and ask for his name…No answer. Dororo goes to sleep while Hyakkimaru is just sit there, without moving, maybe he is dreaming? Or is he feeling something? Nobody knows. Dororo suddenly wakes up, the little one had a nightmare about how the parents were killed, the kid can see that Dororo looks to be awake, but there is no way to know. So it´s time to go back to sleep! The next morning, the duo is traveling and the Ronin can feel another presence, nothing bad, just not human. Soon the duo finds that a near village and the people need some warriors to get rid of a monster! Sweet, they have a job now! The see the village and can see that the things are coming along quite nicely in there, so even if there is a monster nearby, they haven´t been affected. Dororo congratulates the man and tells him that he is doing a good job as a chief, but the man tells them that he is not the chief, the real ones broke her legs and is resting at her house, he will take them there tomorrow. In the night, Dororo talks about how this town is flourishing even though they donpt have much rice or meat or anything; suddenly the kid starts hearing a bell, the ring of the bell starts becoming more and more strong until the door is open and the being with the giant head appears, the supernatural being says the words “You want?” while Dororo is extremely scared at such vision, he then remembers Hyakkimaru and his abilities and is trying to tell him that the monster is here! Hyakkimaru doesn´t do anything and decides not to move, soon enough the big headed being decides to leave. The next morning, they go to the chief´s house which is big and the little kid is impressed by it, there they find the chief, a beautiful woman who is bedridden and responds to the name of “Bandai”. Dororo says that they will take care of the demon; Hyakkimaru takes out his prosthetic arm and is ready to attack the woman in front of him! His efforts are useless thanks to the efforts of Dororo and the man, still this act of violence towards the chief won´t be without fault so our heroes are going to be trapped! Trapped, Dororo starts yelling at Hyakkimaru for such things he did back then, still the Ronin gives no words or answers. While trapped; from the shadows a blind Monk appears he has been trapped in there too. The blind man explains to Dororo how he and very probably Hyakkimaru can detect things, they can sense the aura, as an example, the being that was here just a moment ago, like Dororo, are like white flames; pure, while that Bandai woman has the color of blood, the worst of all. Dororo then ask if the Monk is in here for the monster? Which he says that yes, he is. The conversation is stopped by a some form of tentacle, which was quickly taken care of by our heroes. The group (especially Hyakkimaru and the blind man) goes following such abomination, they will end this evil once and for all! After crossing the tunnel, they reach the chief´s house again and goes to where Bandai is, she says that they must be cruel since they want to harm a bedridden woman who can´t defend herself! Still both the Monk and Hyakkimaru aren´t deceived by her words or appearance and soon they reveal her true form! A demonic lion/dog! Hyakkimaru starts fighting the monster While in trouble the deputy chief caught Hyakkiamru and gives an opportunity to Bandai to escape! Still the Ronin frees himself and continues the battle! The battle goes outside of town and Bandai takes the edge on the battle, still she is not able to finish the Ronin due to the interference of the big headed being, Hyakkiamru takes the opportunity and slays it, Bandai recognizes Hyakkiamrua s the boy from that day, but her words come to (literally) deaf ears and the Ronin ends the life of the demon! The deputy chief laments the dead of the monster, and soon they uncover that they were luring travelers in order to be food to Bandai so the villagers wouldn´t be eaten by her. At the same time, in a symbiotic relationship, in exchange for human sacrifices, she blessed this land with prosperity and peace. Still, the man also uncovers that there is a monster they wanted to kill. The group goes outside and the big headed being with the bell appears, the man says that the bell hurts his ears! The group goes where the big headed being was and they uncover a big treasure, these coins belongs to the travelers, especially the first one that was sacrificed… That man had the same bell as that being. In another part, the Daimyo sends a man to check the hall of hell, in there the figure of a monster that resembled Bandai has been broken. 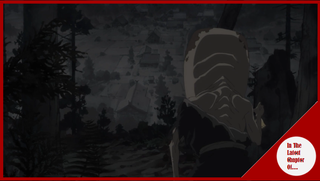 Back with our heroes, Dororo is talking with the Monk and then complains that the name of the Ronin is still unknown! Hyakkimaru touches his face and Dororo puts him away since he is treating like a little kid! Hyakkimaru then starts writing in the ground; the little one can´t read what it says, so the blind touches the ground and with his fingers he is able to read what is written: Hyakkimaru, that is his name. Dororo is happy that the Ronin finally has opened up! Even if a little. After that the group continues their journey, until Hyakkimaru stops…Something inside of him is appearing, the nervous system. A very good chapter! I liked how they put the whole relationship that both Dororo and Hyakkimaru have, were both of them will help each other, especially because Dororo helped him with cooked food. In other point I liked how Hyakkimaru and that old monk see the world, especially how they explained it. Talking about the blind Monk, I wonder if he will be part of the main cast or if he will go his own separated way, and in similar tonic about that doctor that is giving prosthesis to all the bodies out there. Also it seems that Daigo will soon start moving since if someone is killing his demons that´s no good, especially because if Hyakkimaru starts getting his body back, that might have a regressive effect, and I´m not only talking about Daigo´s political power, but the people living on his land will go back to suffering again, filled with hunger and disease; then again… What is better? Free and miserable? Or subdued and with sustain? The answer truly is just to us to answer in our own way, but one thing is certain, Hyakkimaru is here to get both his body back and kill the beings from hell!